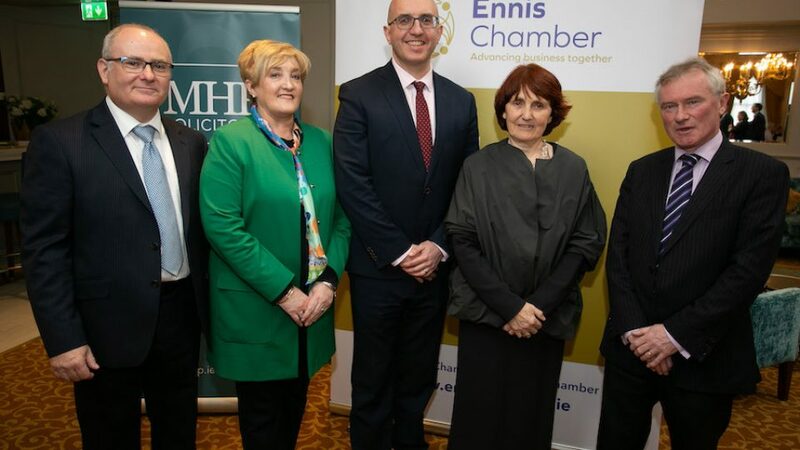 There was a ‘full house’ at Ennis Chamber President’s Lunch’, held at the Old Ground Hotel on Tuesday March 26th, to acknowledge the contribution made by Diarmuid McMahon during his tenure as President of Ennis Chamber, and to listen to keynote speaker Shelley McNamara of Grafton Architects. Diarmuid McMahon, MD of property advisors Sherry FitzGerald McMahon, a fourth generation family-owned business, followed in his father Dermot McMahon’s footsteps by serving as President of Ennis Chamber. The President’s Lunch was generously sponsored by MHP Solicitors. They were delighted to be associated with the President’s Lunch given the legal firms own longstanding association with Ennis Chamber, but also due to the choice of such an outstanding keynote speaker, recognising Shelley McNamara as one of the county’s and the country’s most successful professionals in her field. Shelley McNamara, native of Lisdoonvarna is co-founder and co-director of the multi-award winning Grafton Architects who are based in Dublin city centre, but enjoy a truly global footprint. Shelley’s presentation focussed on the body of work created by Grafton Architect’s over the past decade, since winning the World Architecture Award for its design of ‘Universita Luigi Bocconi’ in Milan, Italy in 2008. Her highly visual overview, which held her audience in thrall, started with the inspiring karst landscape of her birhtplace in the Burren and extended to projects in Milan, London, Toulouse and Lima returning to Ireland to showcase what promises to be yet another seminal project in the shape of the new Parnell Street Quarter and Dublin City Library at Parnell Square, Dublin. Summing up his year as President of Ennis Chamber Diarmuid McMahon said that Shelley McNamara’s presentation was undoubtedly an unforgettable highlight in what was sometimes a challenging but always a very enjoyable year. Other highlights of his year as President included taking over as Chair of the Policy Group and subsequent formation of the Construction & Allied Professional Services Group, which he will continue to chair. That group held high level meetings on the subject of housing and development in Ennis and its surrounds with Clare County Council, Irish Water and with the consultants GVA Grimley who were appointed to create the anticipated Economic and Spatial Strategy for Ennis 2040. Diarmuid McMahon also represented Ennis Chamber on the Steering Committee of that consultation process. Diarmuid also recalled the powerhouse presentation delivered by Carron native Breege O’Donoghue last September to Ennis Chamber as another stellar event. Breege was the director tasked with the internationalisation of the Penney’s/Primark brand and her achievements in that respect are legendary. She is globally recognised as one of the greatest women in business. Diarmuid McMahon assured incoming Ennis Chamber President Gwen Culligan, of County Boutique and Vice President Allen Flynn of Old Ground Hotel/Flynn Hotels that he will be on hand to help effect a smooth transition and to offer support during their tenure. Gwen has already served as Vice-President over the past year and will be supported in her role by Ennis Chamber staff team under the directorship of Margaret O’Brien. Photo Caption: Gerry Flynn, Business & Commercial Partner MHP Solicitors, Gwen Culligan, President-Elect Ennis Chamber, Diarmuid McMahon, outgoing President Ennis Chamber, Shelley McNamara, Grafton Architects and Paul Tuohy, Managing Partner MHP Solicitors.